Woody Evans: Are there any good reasons for “long now” thinkers, technocrats, or transhumanists to care about the Guidestones? 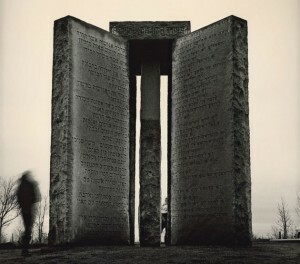 Raymond Wiley: For those who wish to focus on the long term survival of humanity, the Guidestones serve as a good start. The Guidestones mysterious author, R.C. Christian, created a monument which begins to address the methods by which humanity can preserve itself after a nuclear apocalypse, or a more natural one. The possibilty of such a catastrophe is the greatest threat to the long term survival of humanity, and its evolution into something that could be described as trans-human. WE: I keep thinking about the Long Now Foundation (Stewart Brand, Brian Eno, etc. )Â Â Is there a different “type” of human that is able to worry about the next 10,000 years, or are we all capable and interested in these spans under certain circumstances? Â Is R. C. Christian a qualitatively different man than me? RC: R.C. Christian may have been an eccentric, but he is made of the same stuff as the rest of us. It is not uncommon for someone to muse about the long-term future of the species, but it is uncommon for someone to spend their money in an attempt to preserve it. The Guidestones confront their visitors with questions of survivability: How far is this from Atlanta, a potential nuclear target? How far is this from the middle Georgia fall line, which was the shoreline in prehistoric times? What would the world be like if there were only 500 million people in it? These questions can easily become the beginning of a larger meditation on what humanity needs to become in order to survive the passing centuries. In the case of R.C. Christan, this meditation seems to have become a work of artistic community service, mostly likely at the beginning of his retirement years. RC: Let’s hope they remain standing for many centuries to come. However, if the country were to eventually destabilize and the conspiracy theorists and dominonists became more radical and violent, it would seem a likely scapegoat for their superstitions. Luckily, their message will remain on the stones even in they are knocked over and pieced back together for display in a museum. WE: But what if they are right? Â What if it is our right as locals to oppose the will of the globals? RC:Â You have the right to oppose anyone you want, but it would be unwise to link the Guidestones to the â€œglobalist new world order agendaâ€ without any proof. One thing we discovered when writing the book was the fact that the project ran out of money, and that the Guidestones were meant to have more standing stones than were actually built. If the â€œglobal eliteâ€ or whatever you want to call it built the Guidestones, it seems unlikely that they would have run out of funding in the process. I am less of a believer in New World Order conspiracy theories than I once was. Over the years, I’ve watched the anti-NWO subculture move ever and ever farther to the right, and for me this is a great cause for concern. WE: Who is R. C. Christian? Â You know who it is, don’t you? RC: I do not know who R.C. Christian is, but we were able to uncover a number of details about the man in the process of writing the book. Perhaps if you put them all together with a thousand chimpanzees and an Illuminati supercomputer, you could figure it out. I don’t feel too disappointed about not knowing his real identity. It would be satisfying for me to know personally, but I fear that it would demystify the monument too much. The point of the artist remaining anonymous is to create a mystery. The mystery gives the message of the Guidestones a more theatrical air. When one considers the Guidestones as a work of art (which they are), the mystery is an integral element of that work. All that said, if we had uncovered who R.C. Christian was in our research, we would have published that.